The summer after I received my diploma in Romance Languages and Literatures and struck out into the world as a Medievalist, I happened upon I know-not-what Korean Drama on hulu and I could not take my eyes off the 16-episode tale so woeful that it wrung from me every last tear my lacrimal glands could produce, leaving me quite spent. Then I discovered DramaFever and for six months after that I drank in more KDramas than I can count on fingers and toes (several times over) — all with the greedy thirst of a parched wanderer at an oasis. Ah, yea! the draught was sweet, and oh so addictive! I imbibed morning, noon and night, wherever there was a laptop or a handheld and wireless internet to stream. I, who have never owned a television, took in comedies and romances, revenge dramas and chaebol sagas, thrillers and procedurals, sageuks of all manner and period. I could not get enough! And almost immediately, I started to learn. First about Korea today: etiquette and mannerisms, diet and cuisine, trends and sensibilities (oh, and the fashion – the men, especially, are positively fearless! 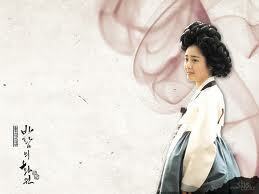 ); then about Korea in yesteryear: Kingdoms and Dynasties, periods and eras, history and culture. Eventually I found myself learning the language; first the masterfully logical and intuitive alphabet, and then about the visionary 15th century King Sejong the Great who developed the script (Hangeul, 한글) for the Korean language (Hangukeo, 한국어); next about the history and politics of Hanja (漢字) , the Chinese script used in Korean, and its philological kinship with Hangeul; and finally about the centuries-long fallow Hangeul underwent before being appreciated and revived following the brutal and much reviled early 20th century Japanese occupation and colonization of Korea. I learned to read and write and speak Korean. People and places and their once exotic-sounding names gradually became a part of my everyday world. Back in KDramaland, experience revealed that there are fewer than six degrees of separation between any two bona fide KDrama stars, a class of master thespians and charismatic entertainers so engaging that they are simply radiant at the center of their respective solar systems in the KDrama galaxy. I, who still do not own a television, developed a healthy (and I believe still-growing) DVD library of KDramas and films, especially treasuring the ones with closed captioning in Hangeul. 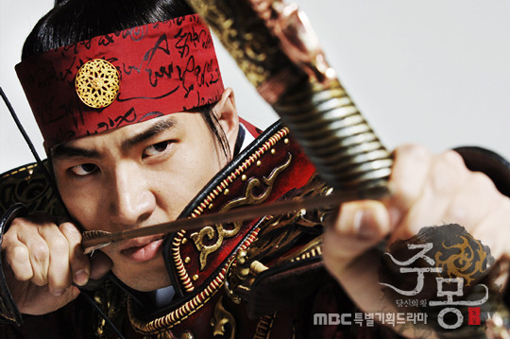 Among my favorites: a generous portion of sageuks starting with the Goguryeo era: Jumong, Kingdom of the Wind, Emperor of the Sea (all three starring Song Il Guk) and The Story of the First King’s Four Gods (aka Legend, starring Bae Yong Jun and dramatizing the legend of King Gwanggaeto the Great); Joseon Era odes to art, music, poetry and all manner of intellectual enterprise: Deep Rooted Tree about King Sejong the Great’s development of Hangeul (starring Jang Hyeok, Han Suk Kyu, Shin Se Kyung and featuring Song Joong Ki), Jewel in the Palace, Hwang Jin Yi and Painter of the Wind (also known as Garden of the Wind, starring the masterful Moon Geun Young and possibly one of the most beautiful showcases that I have ever seen on film of artists at their craft and the brilliant works they create). Also set in the Jeoson Era and once again starring Jang Hyeok, Chuno — an adrenaline rush of a drama that reads like a visual poem to martial artistry. And then I stopped. I am not sure what happened – I may have reached a saturation point beyond which I could drink in no more. I don’t really know why I stopped. I just know that I no longer hurry home just so that I can continue my latest marathon of an historical saga like the blithe agasshi I thought I was becoming. The thirst to imbibe yet another chapter, the need to know what happens next, the desire to see the hero overcome his travails, to see the heroine triumph despite the circumstances – all of that is gone. I’ve even tried rekindling the passion by turning to the works of actors I know and love – nada. This entry was posted in (정용준) Jang Hyeok (장혁), KDrama, narrative, Notes on..., query, travel, 사극 (Sageuk) and tagged Bae Yong Joon, Gwanggaeto the Great, Hangeul, Jang Hyeok, KDrama, Moon Geun Young, sageuk, Sejong the Great, Song Il Gook, Song Joong Ki. Bookmark the permalink. I went through something similar. First the gluttony and then the pull back. I wonder if it’s that when you first begin the type of storytelling and the world we’re seeing is so new and different it all seems wonderful. But then as you gain familiarity your critical brain starts kicking in. Cliches become more recognizable, story tricks stand out, etc., and the magic fades a little. Since this KDrama experience has set me on quite a roll, A suggested that I repost here something I had written on dramababble in response to Maybee’s post about writer’s block. I have no idea what the etiquette is, so I’m making sure that whoever comes across this can click back to Maybee’s original post and read what she had to say that added to my writing momentum. Curiously enough, it was when my KDrama fever broke that I found myself writing again. This is not to say that KDrama kept me from writing. On the contrary: the break in the addictive urgency it provoked made me wonder about the experience and gave me something to think about, to write about. My first blog entry after nine (9!) months of nothing (and after after 13! 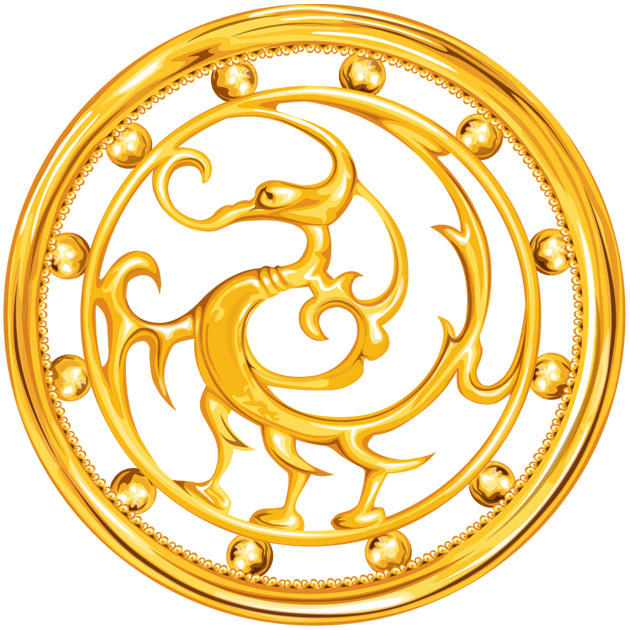 of not really having much to say) was about that experience – I did not even realize how much I had incidentally learned in a few short months in dramaland until I finished the post. 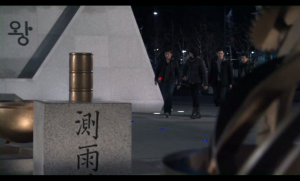 I don’t think I will ever get to the level of blogging about KDrama per se. There are lots of far more experienced and more deeply engaged bloggers doing that already [I just discovered Cadence which just overtook Dramabeans on my follow list]. But I love that I can find in it inspiration to write about the questions I care about in literature– especially narrative, aesthetics and ethics — while still enjoying the escapist, cathartic payoff. I think this is big because nothing on American or European TV has ever really engaged me to consider these questions the way KDrama has. By the time I was watching Cheongdamdong Alice I was a mature enough viewer to know that there was something special about that drama and that maybe I could get back on the writing horse and not fall off. Now I’m testing out that hypothesis with That Winter, the Wind Blows and so far, so good. Cheers! If I understand correctly, it’s been only eight months or so since you fell down the K-drama rabbit hole?! And yet look at your drama resume. And you “learned to read, write and speak Korean.” Wow. I’ve been obsessed with K-dramas for just about 3 years but I prefer those everyday dramas – you know rom-coms and and the ones filled with family shenanigans that let me know about the people and how they live, in the “now”. You, on the other hand, seem fascinated with Korea and its history. I might get there, but it might take me a while, yet. But the one thing you say here really strikes a chord. How you find Hangul logical and intuitive. That aspect of The Tree With Deep Roots had fascinated me. People cite historical inaccuracy with the said drama (which I wouldn’t know), but something about the birth of the written word makes that drama so powerfully moving. I think it’s the only one among your historical menu that I have sampled. heh. Thanks for dropping by my little blog. (b) just how much I have learned from watching them. Even with the drama fever broken, I still find the quality of storytelling, whether contemporary or historical, really impressive. Since I specialize in Medieval (Italian, French and Spanish) and Classical literary scholarship by trade, I have been entranced by the richness of the stories these dramas tell about the Korea of yore. I certainly don’t take the sageuks as documentary and find it kind of amusing that there are those who take issue with the “historical accuracy” of a drama(!) Rather, I see them as windows into the past as seen through a poetic/dramatic lens. In truth, they mostly inspire me to read about their subjects in history books (where I might not have otherwise been moved to do) and help me visually contextualize what I read about in my mind’s eye. 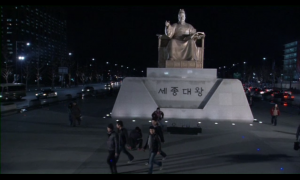 King Sejong the Great and the way he appears in dramas is a very good example. It wasn’t until I watched my third drama (Winter Sonata) that I found myself wanting to learn how to read Korean (Hangeul). I thought it would take a long time but it took less than a day to learn the alphabet (just like in Deep Rooted Tree!) — which was both thrilling and encouraging! I think it was so easy partly because the book I used explained the principles of anatomy and phonology behind the design of the letters and how King Sejong commissioned scholars to create them with a clear and consistent conceptual foundation in mind. This led me to seek out a modern copy of the original treatise of 1443, the Hunminjeongeum (The Correct Proper Sounds for the Instruction of the People), which is close to impossible to find. In any case, I found books about it on Amazon and everything about the treatise made me admire Sejong all the more as a visionary. What is more, I found it really cool that the Hunminjeongeum was developed at around the same time linguists in Europe were getting serious about the history of their languages and Johannes Gutenberg was perfecting the technology for movable type which led to the creation of the first printing press in Nuremberg… I still had not yet seen Deep Rooted Tree but I was learning a lot about Sejong from history books while using kdramas to practice my new language. Later in ep. 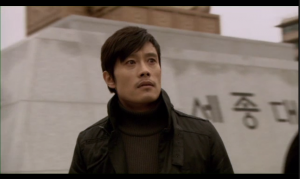 16, the hero super-secret-agent-man (Lee Byung Hun – *squeeeee! *) traces the terrorists’s itinerary back to the same spot and the camera whirls around him as he takes in the square and, thanks to his eidetic memory, quickly associates it with the maps he saw in the terrorists’s hideaway. 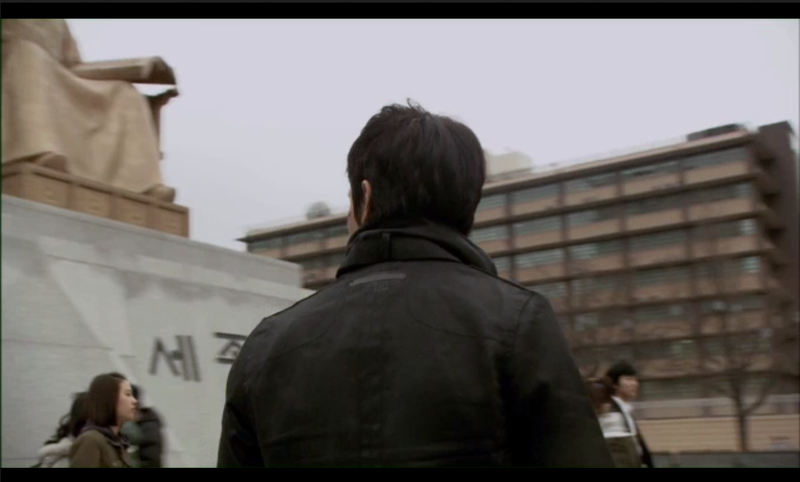 Plot circumstances and skillful shot framing all conspire to remind you that you are now catching the same “세 종 대 왕” in fleeting peripheral vision in crowded daylight that you had seen earlier in clear center-frame in a deserted square at night. Well, since I was at that stage much like a toddler just discovering the secret joy of reading, I stopped the video when I saw the inscription in ep.14 to sound out the syllables which casually spelled out “Se-Jong-Tae-Wang” (King Sejong the Great) in public. Oh, the thrill! In front of the statue lie a celestial globe, a rain gauge, and a sundial, all of which King Sejong invented himself during his reign. Behind the statue, there are six columns with golden carvings depicting the King’s major accomplishments, as well as an underground passage to the ‘Sejong’s Story’ exhibition hall. Surrounding the statue, on the edges of the Square, is the ‘Waterway of History,’ a stream flowing on tiles with inscriptions of Korean history. Mind you, I have never been to Korea, but I hope to go someday and now you know where I’m heading first! In my mind, the connection between what I was learning from reading through and about the Hunminjeongeum and what I saw in scenes like the ones in Iris and later in City Hunter is simply a testament to how deeply King Sejong’s intellectual legacy weaves through Korean history and into the present, helping shape the everyday Korean’s experience of the world and sense of identity through the written word. All this brings me back to the point I made earlier on your blog, Maybee: that the appeal KDrama holds for me is equal parts heart and mind: I find that I can and am happily willing to let myself get caught up in the pathos, however overwrought (well, to a point [more Stairway to Heaven, anyone? Nuh-uh! ]), and in the process also get to learn fascinating new things about a part of the world I knew absolutely nothing about (yes) eight months ago. Again, I have to say: wow! 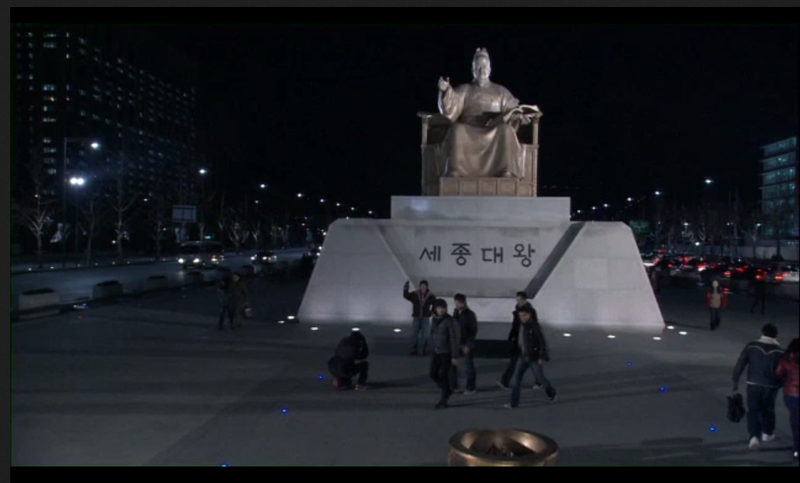 Pretty fitting that the first syllables of Korean you “sounded out/read” should mean King Sejong, its creator. heh. 감사합니다 🙂 * I suppose if we are going to learn, it helps to learn from the best teachers. The man really was a genius — a polymathic, wisdom-of-Solomon type of genius. I really like how Deep Rooted Tree first illustrated his plain intellectual talent and natural inclination for structured problem solving, and then continued to show how his intellect matured as he grew older. I like that they cast that inclination as Sejong’s refuge in his youth — his psychological coping mechanism to counterbalance his father’s primal savagery — and how they later gradually unveiled his long-term application of that intellectual inclination to creating the ultimate tool of empowerment for his people. I even like that in the drama Sejong remains ethically self critical, concerned that he has been motivated not by compassion for his people’s inability to access the written word immediately and personally, but by frustration that they could not even do it when their own lives depended on it. The speech sounds of our nation are different from those of China and are not confluent in writing. Thus, there are many among the ignorant peasants who, when they have something they wish to say, are ultimately unable to express their meanings. Taking pity on this, I have newly created twenty-eight letters, and simply wish for any and all to learn them with ease and use them at their convenience in daily life.